Zhang Daqian (1899-1983) is one of the most important figures in 20th century Chinese art. Never afraid to experiment, he took up the western method of lithography and produced prints in Chinese subjects of flowers, birds, and landscapes. He produced many of these prints in 1972 and 1974 while in San Francisco, including this print of peonies. In China, peony is generally known as 'the king of flowers', symbolizing honour, wealth, and aristocracy, as well love, affection, and feminine beauty. 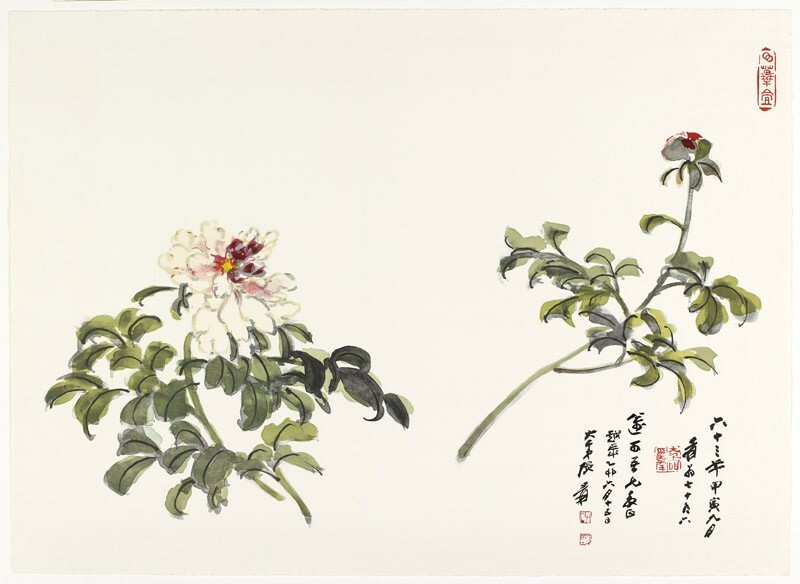 It is usual in Chinese flower painting to depict only a flowering spray rather than the whole plant. The inscription reads "In September of a jiayin year, the 63rd year of the People's Republic. The old man Yuan [Zhang Daqian] at 76. For my elder brother Michael [Sullivan] to correct. [Reinscribed] on 15th June of a yimao year, the seond year [after this print was made]. The younger brother Daqian, Zhang Yuan."